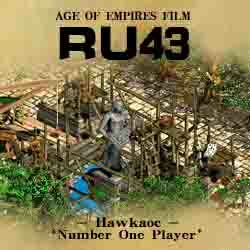 This film is a tribute to a lengedary figure of the Hawkaoc Community. Precise position of map designing. 12 minutes 50 seconds, No.of Triggers: 152, Number of conditions: 119, Number of effects: 2020. Remember to watch it on NORMAL SPEED. Please use the 1024x768 resolution while watching the film. a very interesting visual experience! I recommend the download and it's on my to-review list. It is so perfect and awesome. One of the best cutscenes i have ever seen in my life!! It should be featured somewhere. The most creative cutscene i have ever seen! I will surely get a review up for this. What is the orginal source of the last song (The heroic one, with the choir)? I must learn more... and more. I don't know what his name is yet, by XiaoXu Game Music. It's okay if you don't get the context... just enjoy the visual effects! This is epic :) I was lucky to get the chance to translate it. Well,I'm just so glad to see this cutscene ,which has made a huge hit in Hawk Studio,translated and arised here. Having watched this film,you might say "It's one of the best,the most amazing, the most creative or the most...cutscene I've ever seen.Err...I have to say such compliments have already faded away.Just as our ex-leader once said ,"I just cannot even find an adjective to describe Adongct and his masterpieces!" Yeah,this film is just one of Adongct's most indescribable works. So,with more and more translated works sending here,I truly believe our AOKH friends will learn more about Hawk Studio,and definitely we will always welcome you to come to our community and share your works with us! Watching "A tribute to RU45" is a very unique experience. A huge amount of work has gone into this 13 minute cutscene, which is a tribute to one of the Hawk Studios members. And the work payed off. This has been an amazing visual experience for AOK standards. It is really incredible what one can achieve with a limited tool such as the editor. Some of the tricks used here I have never seen before, and the others are just perfectly executed. It never became boring, though there were some moments in the latter part of the cinematic that could have been shortened a bit (the few ones where nothing totally awesome seems to be happening). All in all, I had a very enjoyable time watching this. The cutscene runs smoothly throughout. I would give this category a 6 if I could, for the amount of effort that the author has put into timing all of the sounds, and making sure that everything is perfect. There are virtually no awkward moments that usually occur at some point in a cinematic longer than 10 minutes. This is by far the highlight. Each and every moment of the cinematic has things that will keep you fascinated through their sheer originality. The author also makes very good use of some traditional tricks, but there are so many awesome and unique things about this that I don't even know where to start. I think it's best to let you discover them for yourself. The music and the overall sound effects greatly increase the quality of the file, taking it one step further. The firework finale is awesome. Another category in which this map shines. The map design is pretty straightforward but at the same time it contains some areas that look stunning, such as the statues. The time that the author has taken to make this shows yet again. Trigger studio and map copying are used to obtain excellent results. I enjoyed the asian castle-archery range combination, which I had never seen before previously. After all the superlatives I've used during this review, it's time to get my feet back on the ground. Though it has it merits as a tribute to a colleague and it is sure to have an impact on Hawk studios members, for everybody else it won't be anything special. Don't get me wrong, it is great to become more familiar with the legends of Hawkaoc, but at the same time I will not remember this cinematic for anything else than its incredible visuals. What I did get from it is that RU43 is a real swell guy, and I'd like to thank him personally for being so awesome as to have a cinematic like this created for him. Watching this will be a very humbling experience for most people that think they know what designing in AOK is all about. In one word: Fascinating. Download now! Thank you very much for rating me work.